What was the root cause of the North Olmsted flooding last week? The initial cause of the flood was a week of unusually heavy rain. Most modern sewer systems are outfitted with many features to avoid a backflow in the event of severe flooding, but the sewer systems in many older cities remain vulnerable. The resulting flood caused the sewage lines to quickly fill up and spew raw sewage into homes. I’ve seen the aftermath of sewage backups, and it’s not a pretty sight. Residents could be seen piling rolls of carpet and boxes of soiled possessions on the curb. What are the health effects of exposure to raw sewage water? Municipal sewage workers and sewage backup cleanup professionals wear full-body protection for a reason – raw sewage water is dangerous stuff. Most severe outbreaks of disease throughout human history were the result of constant exposure to human waste. Even a few tiny particles of sewage finding their way into the human body can cause hepatitis A, giardia, E. coli, and salmonella. When should you call a professional to deal with a sewage backup? 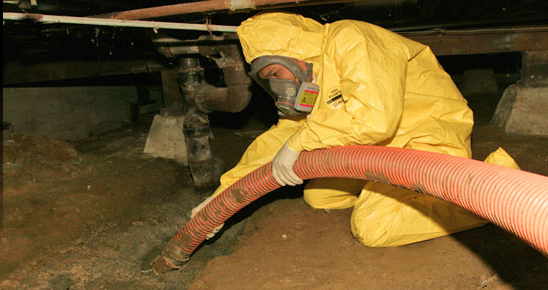 Any raw sewage that has been pumped into the home should be dealt with by a professional. I understand that small floods can often be dealt with by homeowners, but cleaning up raw sewage is not something that amateurs should attempt. Even if you can successfully stop the flow of sewage and mop up the area, the liquid still seeps into the cracks and crevasses in the floor and walls. In addition to smelling up the house, these lingering remnants could harbor bacteria, viruses, and parasites. In the aftermath of a sewage backup water damage restoration is often required to get things back to normal. Can sump pumps always save a home from flood damage? A sump pump is a great thing to have in your basement if it is prone to flooding. However, I have noticed that homeowners sometimes forget one important thing: making sure the sump pump is operational and will remain operational if the power is out, as is frequently the case during severe floods. Installing a battery backup on your sump pump will ensure that it can do its job even during a blackout. Should your battery backup ever come into use, be sure to replace or recharge the battery afterwards. Periodically check the sump pump itself for signs of wear or damage. I can’t think of anything worse than water pouring into a basement with a broken sump pump that should have been fixed months ago! What can be done to stay safe during a sewage backup? Keeping away from the sewage-laden room is the most important step, especially for children, the elderly, or anyone with a compromised immune system. It may be a good idea to get these individuals out of the house entirely and have them stay with a friend, relative, or at a motel. Any furniture or other objects untouched by the sewage should be moved to a safe area to prevent further damage. Anything that has been in contact with the sewage should be assumed to be unsafe. If the sewage cannot be safely sequestered in one room, evacuating the entire house will be necessary.